289 Jan DOYLE: THE VALLEY OF FEAR (Frank Wiles). Issues 285-293. 290 Feb DOYLE: THE VALLEY OF FEAR (Frank Wiles). Issues 285-293. 291 Mar DOYLE: THE VALLEY OF FEAR (Frank Wiles). Issues 285-293. 292 Apr DOYLE: THE VALLEY OF FEAR (Frank Wiles). Issues 285-293. 293 May DOYLE: THE VALLEY OF FEAR (Frank Wiles). Issues 285-293. TOLSTOY, Count: HOW MUCH LAND DOES A MAN REQUIRE? * (Warwick Reynolds) Special translation by Alder Anderson. ROBINSON, W. Heath: THE FINE ART OF MAKING A WAR FILM. Six drawings. 299 Nov WODEHOUSE, P.G. : THE MIXER (J.A. Shepherd). Issues 299-300. ROBINSON, W. Heath: illustrates "The Ogres of Ojejama"
(DOYLE). Photograph of duel scene from Brigadier Gerard, illustrating "Stage Celebrities in Cinema"
WODEHOUSE, P.G. : THE MIXER (J.A. Shepherd). Tinted drawings. Issues 299-300. TOLSTOY, Count: WHAT MEN LIVE BY* (Thomas Somerfield). A. Anderson, translator. ROBINSON, W. Heath: illustrates "The Astragen Waistcoat"
303 Mar (DOYLE). HISTORY OF THE BRITISH CAMPAIGN IN FRANCE. * Full-page announcement. 304 Apr DOYLE: THE BRITISH CAMPAIGN IN FRANCE: THE BATTLE OF MONS* (drawings) Issues 304-318,329-330,334-335,337-338. ALLEN, Raymund: THE KING'S ENEMIES (Dudley Tennant). Military chess story. ROBINSON, W. Heath: THE INVENTOR AS SPORTSMAN. Four drawings. (DOYLE). J.E.VEDRIENNE: THE REFLECTIONS OF A THEATRICAL MANAGER* (photographs). Reference to Sherlock Holmes; photograph of Doyle. BENTLEY, E. C.: ORDINARY HAIR-PINS (A. Gilbert). WELLS, H.G. : THE LAND IRONCLADS (Claude A. Shepperson). Reprint, Issue 156. WODEHOUSE, P.G. : UNEASY MONEY (Clarence T. Underwood). Issues 312-318. (DOYLE). 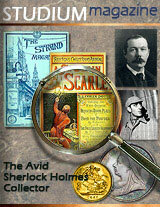 Burton Egbert: STEVENSON: SUPREME MOMENTS IN DETECTIVE FICTION. * Reference to Doyle and Sherlock Holmes, small portraits of both. WODEHOUSE: UNEASY MONEY (Clarence T. Underwood). Issues 312-318. ROBINSON, W. Heath: WHEN PEACE COMES ALONG. Six drawings. WODEHOUSE: UNEASY MONEY (Clarence T. Undexwood). Issues 312-318. WODEHOUSE: UNEASY MONEY (C.T. Underwood & J.E. Sutcliffe). Issues 312-318. 319 Jul DOYLE: IS SIR OLIVER LODGE RIGHT? : "YES". * Opposing view by Edward Clodd. SHEEHAN, Perley Poore & R.H. DAVIS: BLOOD AND IRON: A PLAY IN ONE ACT (Steven Spurrier). War-time science fiction. 328 Apr DOYLE: THREE OF THEM: I. A CHAT ABOUT CHILDREN, SNAKES AND ZEBUS* II. ABOUT CRICKET* (photographs, drawings). Issues 328,331-332,336,384,392. 329 May DOYLE: THE BATTLE OF THE SOMME. * Part one. ROBINSON, W.Heath: WAR-TIME ECONOMICS. Text and drawings. 330 Jun DOYLE: THE BATTLE OF THE SOMME. * Part two. ROBINSON, W. Heath: THE MILITARIZATION OF CHRISTMAS. Four drawings. 341 May (DOYLE). COMPETITION FOR NOVEL-READERS. * Competitors are to identify depicted characters, including Sherlock Holmes. 343 Jul (DOYLE). David DEVANT: A VISION OR --? : IS THERE A SHERLOCK HOLMES AMONG OUR READERS? (Dudley Tennant). For the reader to solve. Issues 343, 345. ROBINSON, W.Heath: CHIVALRY UP TO DATE. Four red and black drawings. 346 Oct (DOYLE). David DEVANT: THE SECRET OF THE MYSTERY OF "A VISION OR --?" Solution of the mystery in Issue 343. (WELLS). Arthur LYNCH: H.G.WELLS AS HISTORIAN: AN INTERVIEW* (photographs). (DOYLE). £250 SHORT STORY COMPETITION. * Announcement. Competition to be judged by A. Conan Doyle, H. G. Wells, H. Rider Haggard and Charles Garvice. Issues 348, 353, 354. ROBINSON, W. Heath: SOME LABOUR-SAVING DEVICES. Red and black drawings. WELLS, H.G. : THE WAR OF THE WORLDS (Johan Briede). Condensed by author. WALLACE, Edgar: THE MAN WHO CAME BACK. The story of the revue sketch The Whirligig, of which Wallace was co-author. (DOYLE). Result of £250 SHORT STORY COMPETITION, with comment by Doyle and other judges. * Issues 348, 353, 354. 354 Jun (DOYLE). Herbert TREMAINE: THE FLOWER-SHOW AT KWALIZ (Rene Bull). Awarded second prize in £250 Short Story Competition; Doyle and H.G. Wells selected it for first prize. Issues 348, 353, 354.